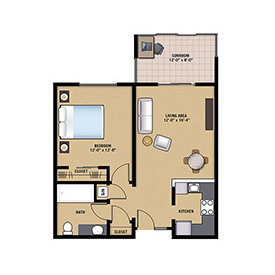 Our welcoming, carefully planned layouts offer an ideal foundation for creating your new home. If you’re looking for your studio apartment for a carefree retirement, the Birch offers cozy comfort paired with an escape to its inviting patio. For a little more space, consider the one-bedroom Beech or Dogwood, or perhaps the deluxe one-bedroom Cherry. Additional one-bedroom floor plans are available. 1 Bedroom, 1 Bathroom, 348 sq. 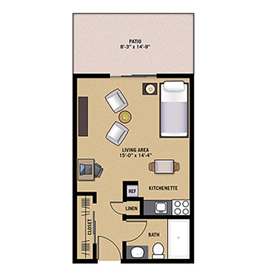 ft.
1 Bedroom, 1 Bathroom, 579 sq. ft.
1 Bedroom, 1 Bathroom, 696 sq. 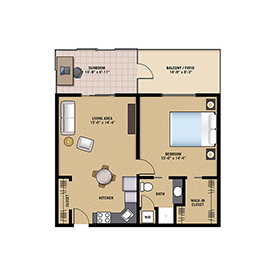 ft.
1 Bedroom, 1 Bathroom, 634 sq. ft.